Taeyoung M&F is maintining the No. 1 position in Korea with highprecision, mini-sized and high-slimed “2 stage discharge electrical precipitator.” And, it was recognized as the unique manufacturer in Korea which has ability to develop and to produce the Desmoke equipment using for smoking box. Taeyoung M&F has experienced and advanced technology of electrical precipitator and filter industry for years. 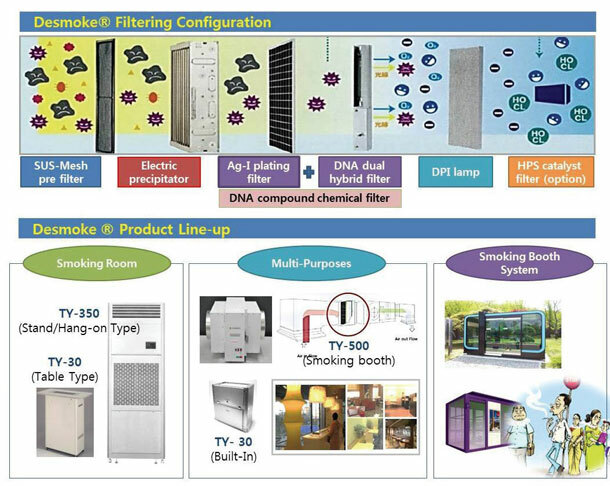 Desmoke® is the proprietary brand by Taeyoung M&F which has been proved by advanced technology for not only filtering of heavy metal, carcinogen but also the decomposition of tar and anti smoke spread design with the authentication of K Mark, EMC, CE, KE, MIC and 5 Patents. It is proven technology in the field – Samsung, Daewoo Eng.& Con. and is also proven technology for filtering of heavy metal and carcinogen. This technology called most effective technique for decomposition tar and Anti smoke spread system design. It delivers the best safety and user friendly design – three safety switches, automatic power off, and automatic operations. Getting increased social need of securing clean air, Desmoke® product/system is expected to help your customers & businesses maintain a healthy environment. Filed Under: KOTRA Tagged With: Desmoke equipment, Desmoke®, Smoke reflector, Taeyoung M&F Co. Ltd.